Columbus Cruise Center Bremerhaven (CCCB) is one of the most modern passenger terminals in the world. Located at Columbuskaje, the terminal was refurbished in 2003 and the investments in modern handling facilities for cruise liners and tourists have proved well worthwhile, as this sector appears set for continuous growth. In 2016, the statistics reported a passenger figure of 96,500. As the location has attracted new customers and cruise liners continue to grow, the number of passengers could double within just a few years. 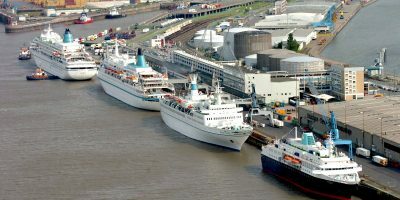 The principal destinations served from Bremerhaven are ports in Northern Europe (Scandinavia) and the Baltic, but the list also includes ports in the UK, Iceland and Greenland. Up to four cruise liners can be handled simultaneously at the roughly 1000-metre long quay – in compliance with strict safety and quality standards. The infrastructure is designed to cope with vessels of all sizes. The terminal has spacious check-in and waiting areas that can accommodate around 4000 passengers, modern equipment for transporting and loading their baggage, and covered passenger walkways. All of these amenities make the CCCB an attractive maritime competence centre for passengers, cruise shipping lines, tour operators and ship agents. Ever since it was founded in 1827, Bremerhaven has traditionally been an important seaport on the German North Sea coast. The vast numbers of people emigrating to America led to an enormous upswing in the city’s development as a maritime location. Since the 19th century, more than eight million people have departed from here, hoping for a better life in the New World. The shipping companies soon realised that transatlantic traffic was an attractive business option. The inauguration of Columbuskaje in 1927 (where GI Elvis Presley was to set foot on German soil decades later) further enhanced Bremerhaven’s reputation as a port for passengers travelling to and from America. During the 1960s, however, the heyday of conventional Atlantic passenger shipping gradually ebbed as transatlantic flights became more and more affordable. Life at the terminal is now dominated by cruise liners, a business segment which becomes more and more interesting for the port on the mouth of the Weser with every year that passes. The German Emigration Centre, the German Shipping Museum, the climate museum ‘Klimahaus 8° Ost’, Zoo am Meer, the Museum of History and Schaufenster Fischereihafen at the former fishing port are just some of the attractions that fascinate hundreds of thousands of visitors to Bremerhaven every year. In addition to holidaymakers and day trippers from other parts of Germany, cruise ship passengers are increasingly interested in sightseeing around the seaport and use their short stay here to visit some of these places of interest. What’s more, the huge cruise liners and the hustle and bustle on the quayside are in themselves interesting enough to pull in the crowds. Bremerhaven’s passenger terminal makes an important contribution to the city’s growing attractiveness as a tourist Destination. Would you like to know which cruise ships arrive and leave in Bremerhaven? Then visit the website of the Columbus Cruise Center in Bremerhaven.